Commercial & Residential Roofing & Gutters. Leak repair Specialist! Want to connect with Mathew? 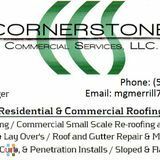 Cornerstone Commercial Services is a full service commercial, industrial, and residential roof service company serving the entire Michiana area. We are union-trained and highly attentive to details. We are also specialists in leak detection and elimination. We are fully licensed and insured. "Union tradesmen quality without the union contractor price!" I been roofing for 15 years. I'm a shingler. Recently passed the roofing test of illinois and am currently unlimited certified. In hope to grow in the trade.